Nikon’s new COOLSHOT 20i Golf Laser Rangefinder provides incredibly fast, accurate distance measurements for every shot—even those involving elevation changes (slope). 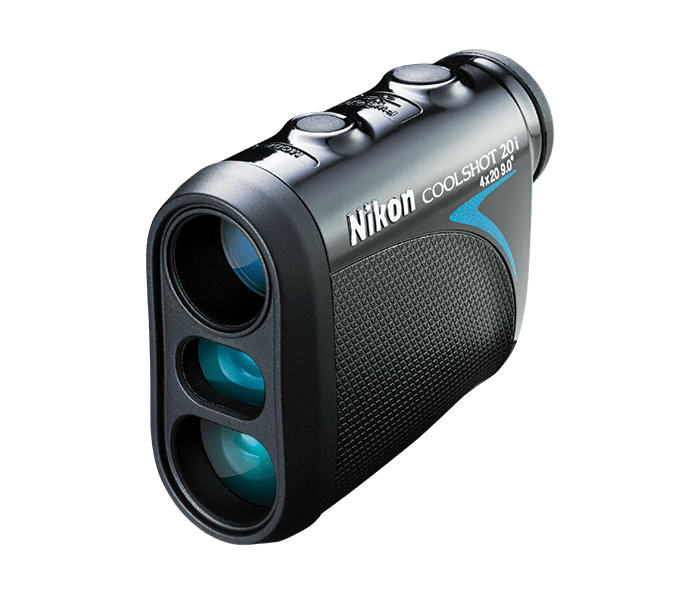 This rangefinder features Nikon ID Technology, allowing stress-free club selection when facing a shot with elevation change. This ID (Incline/Decline) Technology feature eliminates second-guessing on how far uphill or downhill a shot will play. With so many unforgiving elements on a golf course, don't let elevation change be one of them. Multilayer coatings and a bright 4x monocular provide higher light transmittance across the entire visible light spectrum. This minimizes the loss of light due to reflection, thereby ensuring a more natural, clearer view. Get the slope adjusted distance for any uphill or downhill shot, thanks to Nikon’s highly advanced ID Technology. One push (and hold) of the Power button and the rangefinder will continuously measure the range for eight seconds. This is useful when trying to find measurements of multiple or very small or thin objects, allowing you to know the distance to hazards, pins, mounds, and trees in one push of the button. With this feature, you have the ability to scan across the green to easily pick out a flagstick from the background. The First Target Priority Mode feature displays the range to the nearest target among the multiple results obtained. This assures that the measurement shown is the pin and not any objects in the background. For a clear and comfortable view, especially for people who wear eyeglasses. Warm days or hilly courses can make even the lightest golf bags seem like a big load for 18 holes. That’s why the COOLSHOT 20i golf laser rangefinder was designed to be extremely lightweight and compact. Whether stowed conveniently in your pocket or attached to your bag, you’ll hardly notice the 4.8 ounces of the COOLSHOT 20i.